Here’s is the next float in my FO Parade! Only one today, because I have something else awesome to show you too. He’s more or less what I call my “formula bear”. When I start crocheting something, I have no idea what it’s going to be. Often I’ll have the body and head before I even have a clue what kind of critter it will be. Sometimes it even comes down to the ears. But, if nothing strikes my fancy along the way, they become a bear like this. I love these bears though, even though I can do them on autopilot now. I especially love this little gentleman because of his wonky eye and lopsided nuzzle. And his little tongue! The other thing I wanted to show you is a gift from my lovely friend Kate, who has a food blog called The World Is A Chocolate Cupcake which you should check out. Anyway, she has been taking sewing classes at Thread Den and she got a sewing machine for Christmas, and she made me this project bag! Firstly, who does’t like presents? Secondly, who doesn’t love handmade presents? And furthermore, a thoughtful gift is the most awesome, and clearly Kate knows me pretty well. I LOVE project bags. I mean, I have tons of them and it’s never enough! 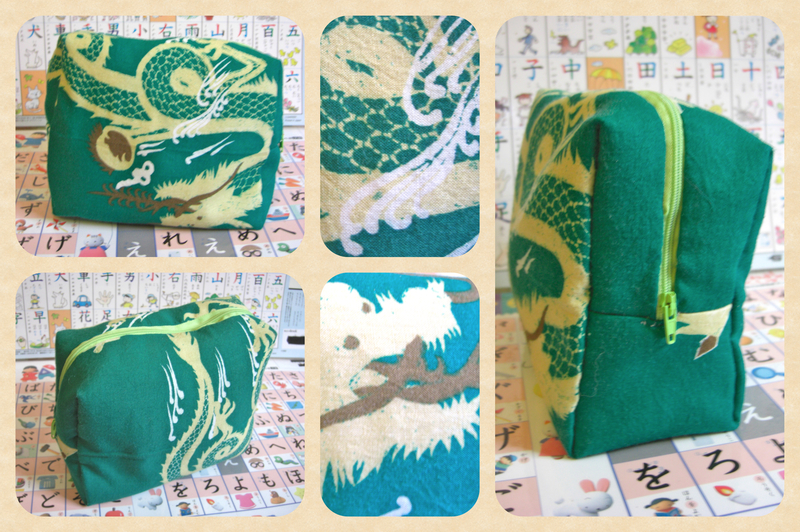 I usually buy drawstring bags from Japanese dollar stores (if you’re looking for a good, cheap project bag and you’re in Melbourne, check out Daiso right this minute!) but I’m always looking for new ones. And I love green (in case you haven’t noticed) so when she presented me with this little treasure I melted! I love, love, love it! She’d also stuffed it full of all kinds of interesting yarn remnants which I’ll put to good use soon, I’m sure. 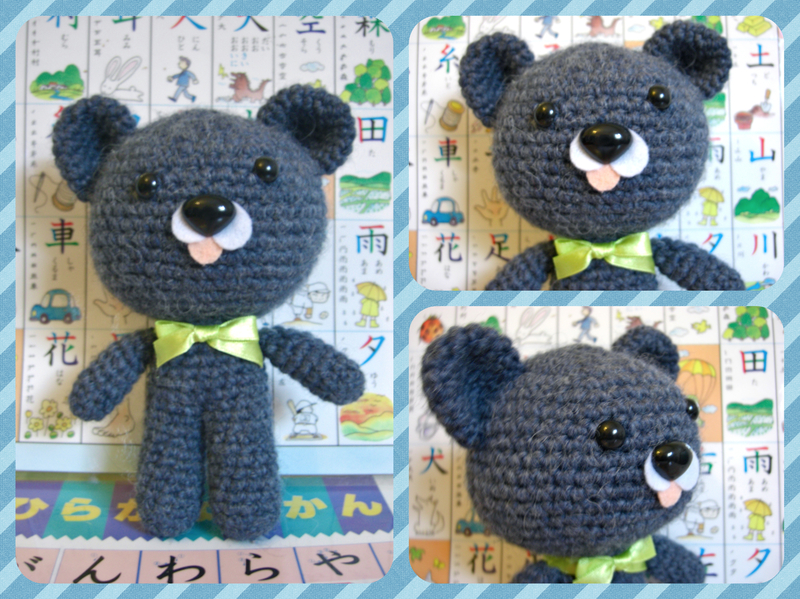 It’s the ideal size for an amigurumi-to-be and some yarn. I can even fit my little notions pouch in there as well. Perfection! What’s the best handmade gift you’ve ever gotten? Or that you’ve given? Ooh, do tell! My friend Katy made me a cute and kitchy cushion that says “Good friends are a work of heart”. I adore it. Any handmade gift is wonderful – the wonkier the better I say. I have posted off 4 presents this month to my friends just because. I think “just because” presents are the best! You can’t buy wonky in the shop, that’s why it’s lovely! “Just because” presents are totes the best; I have a few of those to send of soon, too! i love the lil’ bear! i actually don’t receive many 9if any) handmade gifts, i think people are intimidated to give their handmade cuteness or something. however, i LOVVVEEEE giving handmade. i made a skirt for my best friend for christmas and i was pretty chuffed about it. haha. My mum crocheted me a set of 6 placemats with lovely white lillies in the corners just before I got married 32 years ago…… and i’ve been able to pass them on to my daughter Fiona….. I didn’t use them very often, but that’s okay because now they are being used by a second generation! I love all the stuff you make…… I made my grandson Jacob a teddy bear earlier in the year….. and I am now knitting teddy cuddle rugs for the babies in Vanuatu….. always something to do! I really want to make some bunting to hang about the place! I haven’t decided if it’s going to be knitted, crocheted or sewn yet. Perhaps a mix? Flagflagflagflag!